It's official: 2009 has been the fastest year to fly by out of all my 20 years of existence. No lie, it feels as if my trip to Colombia from the summer was just yesterday, when in actuality, it was 5 months ago. Sadly, I won't be able to go back for the holidays, but I am planning a major 3 month trip for the summer, so... I can't wait!!! This semester's almost over as well. It's incredible how fast it's flown by. Registration for next semester was this past week, and hopefully I was able to get into all the classes I wanted/need. Apart from registering, I've been on a baking rampage. I started off with this new kind of fruit bread from Williams-Sonoma: Bread. This bread is incredibly moist, and smells really really good. It fits into this season because of its cinnamon undertones mixed in with all the dried fruit. My dad really enjoyed it, and is already requesting for Thanksgiving dinner. 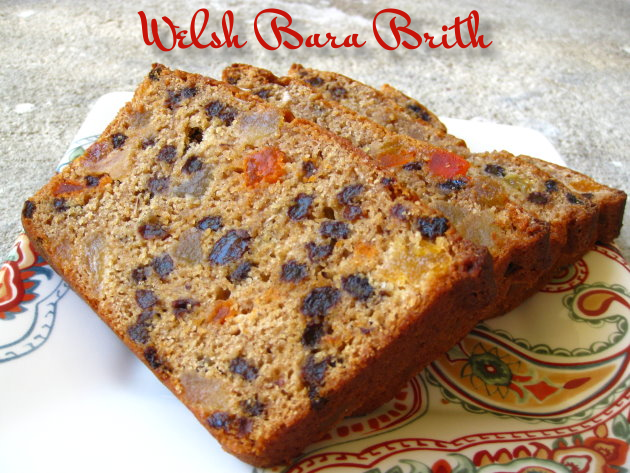 On another note, according to the authors of WSB, there's a really nice bit of history to Bara Brith. "HISTORY OF BARA BRITH: British baking has a long-standing tradition of fruit breads leavened with baking powder and destined for the tea table, and every region has its own recipe for currant bread. Bara brith originated in the Welsh countryside, bara being the local word for bread and brith meaning spotted or freckled. The dried fruit is soaked in tea to plump it, and a sweet spice blend is typically ground fresh in a mortar for each batch of bread." 1) Pour the boiling water into a heatproof bowl. Add the tea bags and let steep for 10 minutes; remove the tea bags. Add the mixed dried fruits, currants, pineapple, and brown sugar and stir well. Cover with plastic wrap and let stand at room temperature for 1 hour to plump the fruit. 2) Preheat the oven to 325F. Grease a 9-by-5-inch loaf pan. 3) In another bowl, stir together the flour, baking powder, baking soda, cinnamon, and salt. Add the soaked fruit and its liquid, the egg, buttermilk, melted butter, and marmalade. Stir until well blended. Scrape down the sides of the bowl and spoon the batter into the prepared pan. 4) Bake until the loaf is brown and crusty and a cake tester inserted into the center comes out clean, 1 1/4 - 1 1/2 hours. Let stand in the pan on a rack for 10 minutes, then turn the loaf out onto the rack. Serve warm or at room temperature.